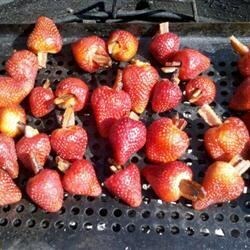 "Summer is here and what better way to go outside and grill the summer fruit? This is great for summer, you have the salty and crunchy from the bacon, and you have fresh sweet and bitterness from the strawberry. Unbeatable combo; give it a try." Cut a cone shape out of the top of each strawberry with a sharp paring knife, leaving a small hollow. Stuff the strawberries with chopped bacon. Cook on the grill until hot, about 2 minutes, turning frequently to cook evenly.